Maltaward provides the supply of Temporary Vertical Concrete Barriers to both the public and the private sectors for a number of purposes across the UK. 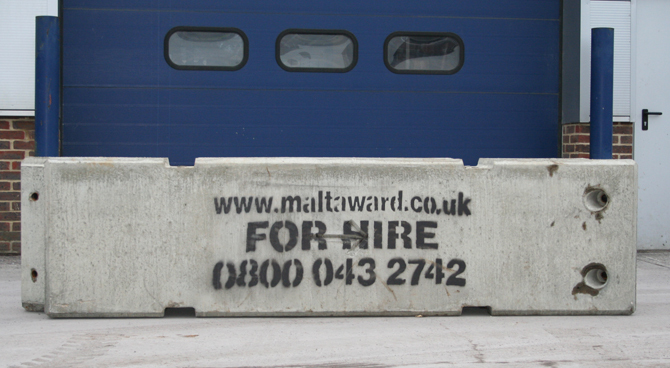 Located in Crawley, Birmingham, Nottingham, Coventry and Leeds, Maltaward offers a wide range of concrete barriers available for hire as well as a number of other security services. Our temporary vertical concrete barriers available for hire come in a range of different sizes, weights and dimensions that are suited to your specifications and can be used for multiple purposes, such as maintaining the safety of private spaces, ensuring security on a building site, traffic control and more. In addition to TVCBs Maltaward also offers a range of plastic barriers available for hire, as well as security barriers and gates, temporary security fencing and more. For more information on the range of temporary vertical concrete barriers we offer to hire, or should you have a query regarding our other services please do not hesitate to get in contact with us. We are reachable by phone on 0800 043 2742 or you can also fill in the contact form with your details and your query and we will get back to you as soon as possible.